SeaMoon is the solo project of Simon Neumann, a German artist specializing in exotic psychedelic downtempo beats. 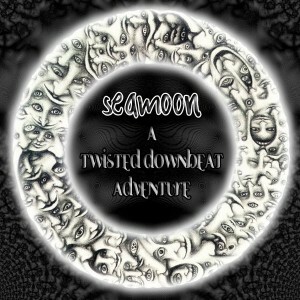 With five years of production experiments behind him, SeaMoon is ready to make a big splash with his aptly-named debut, A Twisted Downbeat Adventure, released on the Chillbasement netlabel. This release contains five tracks loaded with swampy organic grooves, fat dubby bass lines, and deeply mysterious atmospheres. Expect to find yourself hypnotized on a moonlit night with these high-quality chillers! MP3 Download | FLAC Download | WAV Download · Download count: 20,901. Released under a Creative Commons licence for noncommercial usage. Visit Chillbase for more downtempo music! Like it a lot..give me memories from Antaris 2008..And i also love the Germany people very much…Love this site.. This is a very good album. Downtempo intelligence at its finest. Thank you! Wow, yet another really excellent release! So many artists get over indulgent but this one is just perfect. ps. Also check out Yggdrasil’s new album “Prose Edda” if you like this! What a fabulous record. Cheers my friend, for releasing another winner. Many thanks to Chillbasement for allowing you to distro. The free Psytrance revolution continues to gain traction!! Top stuff :-) Liking lots! Fantastic release, superb music, just the way I like psychill, congrats! I would really like to download this one, but the link doesn’t work (instead of linking to this album, I get “Pop The Cherry EP”.. can you fix this? It’s working now, thanks a lot, pretty awesome record! i really love the downtempo stuff, and this one is just right! takes me back to the days of the Waveform records A.D. series..
Great release! I’ve been listening to it a lot lately. One of the my favorite albums! Simon, ich will 1 Kind von dich! Jetzt! Get naked! Ausziehn Ausziehn Ausziehn! Mystical music! Within 40 min’s my mind has left my body..
Hope to hear more of this amazing music soon..
Peace and love.. May the force be with you, Simon Neumann… Thank you! One of my favorites!! Loved it, can’t get enough of it. Keep it up!! Thank you for this great piece of music! I love to listen to it late in the evening with some good weed. Seamoon ….just the most awesome stuff I’ve heard in a long time…..
….can’t wait for MORE from this guy…. just a freaking awesome downbeat sound,must add this to my playlist for my friends next time we party.downbeat is my new favorite of electronic music,from goa trance to dubstep ive tried to get my set and settings but downbeat defenitly THE stuff.vielen dank,herr neumann. me be wanting more like THAT ,Simon….